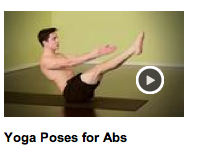 Click on the image here to watch my video for Livestrong.com on Yoga Poses for Abs with Juan Castano. If you’re sitting in a desk all day, you have neck pain, shoulder pain, back pain. I’m Kiki Flynn and this is Yoga for abs. If you’re sitting in a desk all day, you have neck pain, shoulder pain, back pain. Let’s tone and strengthen our abs and reduce all of this discomfort for a happy work day. In Yoga we develop our abdominal strength along with our lower back strength and our core strength. And so, we’re going to move through this Yoga for ab set in stages. As always, we’re going to have deep breathing through the nose. And just keep your toes there, pull your knees together and reach your arms. Lower your back. Chances are when you start, if you don’t have a lot of strength in your core, you’re going to be back here. So, come right on the tip if your toes. Let’s take a few breaths and good. When you have eased here, we’re going to move to the next stage. Lift your toes right here in front of the knees, shoulders are down, big inhalations. Full exhalations, toning your waist. When there is strength in this position and steadiness, we’re going to straighten the legs within inhalations, straight legs. Good and breathing here and let’s take three breaths here. And here’s our full set. Exhale, your hands to the floor, tuck your knees, cross your ankles in, inhale, up, exhale, down. Inhale back to our boat pose, straight legs, one, up, and down. And once more inhale, and exhale, down. And when you have a lot of strength, pick it up, jump it through. And we’ll just go to a Downward Dog. And let’s come back to that Navasana, let’s come back to that Boat Pose. Inhale, right up, excellent and rest.